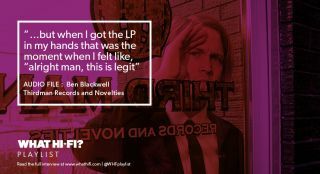 Audio file: Ben Blackwell, Third Man Records | What Hi-Fi? We speak to Third Man Records co-founder Ben Blackwell to find out what goes into being one of the world's most innovative vinyl-focused labels. To Third Man, gimmick and novelty are not necessarily dirty words. If their kind of innovation within the medium is geared toward getting music to more people than perhaps may have otherwise heard it, that can only be a good thing. Can’t it? For his part, Blackwell’s focus was already very much on vinyl by the time his uncle, Jack White, called on him to help take Third Man from name-only legal entity to fully-fledged record label almost a decade ago. Indeed, at a time before vinyl became hip again he set up Cass Records with money given to him by his mum – an alternative to the school fees she’d paid for his siblings – and subsequently released a slew of 7in and 12in 45s. But if Cass’s approach resembled more the DIY aesthetic of so many of those seminal indie labels – a Fast Product for Detroit, you might say – Third Man’s vinyl output has been a wildly different vehicle. We’ve been bestowed tracks hidden under centre labels, records that smell like peaches and even records featuring floating holograms. Third Man isn’t the only label currently exploring new territories in the physical make-up of vinyl, but you’d be hard pressed to find anyone else doing it with such purpose and enthusiasm. Here’s all we found out from its co-founder. "Can't do this without you"
What Hi-Fi? : So how did Third Man Records come about? Ben Blackwell: Third Man began kind of in name only. When The White Stripes began making the move from smaller independent labels to larger ones, the deals they were signing were licensing deals, and the licensing entity was Third Man Records. It was created in name alone as kind of an insurance policy for the band, so they wouldn’t get jerked around by these bigger labels. There were no employees, there was no office, it was just this legal entity. That's about 2001 it starts; they start signing with XL and V2 around that time. I had been running my own label in Detroit for five, almost six years at that point, almost exclusively vinyl, figuring out the process and the lay of the land, not really at a time when vinyl was super hot. But he said, “I’d love you to come along, I can’t do this without you”: I remember those words very, very clear. WHF: So the emphasis on vinyl begins because of those licenses, but there’s also obviously great enthusiasm there. BB: You know, the first big recording I worked on was an album by my band The Dirtbombs called Ultraglide In Black, and it didn’t feel real until I got the LP of it. The CD is like, “Okay, that’s cool”, but when I got the LP in my hands that was the moment when I felt like, “alright man, this is legit”. And I think that’s true for a lot of musicians; I don’t think there’s too much sentimental attachment to compact discs. WHF: So everything’s done in-house when Third Man makes a vinyl record? BB: Yeah, as much is done in-house as is appropriate. So as of February we’ve built a pressing plant in Detroit, so as many of our jobs as make sense to go there, they go there for pressing. Not everything - maybe someday everything’ll go there, but maybe not. But all of our customer sales is done here in-house, all of our website and social media’s done here in-house, all of our visual design is done here, most of the mixing done here in-house, merchandising, fan club, wholesaling, archives etcetera, etcetera, etcetera. All of that stuff is done in-house. WHF: You said most of the mixing is done in-house? BB: Yeah, well when I say in-house, we have a mixing studio here but also Jack has a studio in his property and a lot of the mixing is done there, so I consider that still in-house. WHF: So when you’re releasing these records on vinyl, but also on different formats and digitally, is it mixed or mastered differently? BB: Sometimes. Not necessarily always. On certain reissues you may only have one specific mix or master to work from, in terms of things from the early 1900s where there may not be master tapes - you’re reliant on the transfer of one existing scratchy copy of a 78. But other times, if it’s something we do newly, for example the Jack White solo albums, there’s definitely a vinyl master and a digital master, and those’ll be exceptionally different. Your vinyl master is going to be – I suppose you’d call it a pre-vinyl master, because the actual vinyl master is what’s cut into the disc – that’s going to be different to the digital master, and we definitely keep that in mind in terms of our processing or our signal chain. WHF: And that’s mainly to combat compression of digital files, mixes for radio and so on? BB: Yeah, that’s definitely part of the mind-set. I think it was Lazaretto, Jack was saying he didn’t apply compression anywhere until the final mastering, so nothing was compressed until that last mix-down to the master, and he said it sounded oh so good. He was like, “Oh gosh, this is how we should do it all the time”. WHF: You mentioned Lazaretto: how did you get from cutting the album to vinyl to the ULTRA LP? How did all those ideas come about? BB: Most of those things we had utilised previously on other records – whether it was hiding grooves underneath the centre label or [the record] playing inside out, or even dual grooves – we had done that before. So Jack had the idea while recording the album, "I wonder how many of these tricks we can cram into one record and totally, really, really push ourselves with it?" And in the process we came across two new ones we hadn’t done: one was the dual groove joining in the middle of a song, for Just One Drink, and ultimately the hologram in the run-out etching, based on the reflected light. The hologram especially, that was the last one to come through. That was the one we weren’t really sure was going to work. We didn’t have any examples of how that would go in terms of a pressed record – we knew it worked with other materials and other mediums – so we’re talking about getting down to the days where if it doesn’t work we need to just scrap that idea and just go. Because our initial order on that record was 75-to-80,000 copies, and we didn’t stop pressing until we hit 100,000 as orders kept going up. But when you get handed a record that has a hologram on it, you realise that’s never been done before. It’s a wonderfully sobering moment when you realise people have been listening to music on discs for 120-plus years and this has never been done before. Same as the world’s fastest record, we made a record in three-and-a-half hours: holy sh*t! It makes you work so much harder finding other things that’ve never been done in that regard. WHF: Is it important for vinyl as a medium to have people innovating like you are? BB: In our estimation as a company, yes, that is important. The name of the company is Third Man Records & Novelties, and there’s definitely a novelty aspect to all of that. Some people might want to call it gimmicks, but coloured vinyl’s a gimmick too, gatefold jackets can be considered a gimmick, everything’s a gimmick. Jack is often fond of saying that. So if you can rightly assume that everything is a gimmick, ultimately these gimmicks are just trying to entice people in. If coloured vinyl’s a gimmick that gets people to listen to Charley Patton LPs then put it on coloured vinyl. If young kids are going discover delta blues music because of these gimmicks then we will gimmick the sh*t out of this stuff. If old, academic folk ways aren’t what’s going to get them into blues, folk or bluegrass music: understood! Maybe that’s why it hasn’t happened large scale over the years, I don’t exactly know. But ultimately everything has a purpose: to get the music consumed. And I know lots of people buy records and don’t even listen to them but, sh*t, if they’re even buying them then that’s 50% of the battle, you know? WHF: You read our piece about this kind of innovation, and whether it ought be considered art beyond the merit of the music - is that a consideration while you’re creating these vinyl records? BB: Absolutely. Anything created in our realm, at some point in the process you do the artistic thing: how is this art? How does this serve art? What is the artistic value of this? So absolutely: music is art, visual representation is art, 100%. We’ll talk about art or the ideas behind it all the time here, what means what, perspective, impression. All that stuff. WHF: Do any ideas come to mind that haven’t fit that process, or anything you’ve tried that just hasn’t worked? BB: Not really. Probably nothing beyond a brief brainstorm. It seems pretty clear when we talk and we’re throwing ideas around of, “ah, that’s actually not possible”. We’ve never got to a point with an idea where it’s like, “oh right, this is gonna work, it’s gonna work”, and then like, “oh, it doesn’t work”. We have pretty accurate gauges on the front end that prevent us from going down a rabbit hole or on a wild goose chase that ultimately proves unsuccessful. WHF: So the hologram’s the closest you’ve ever come to that, and it still came off? BB: The hologram was definitely one that was like, “Oh , I don’t know if this’ll work”, and it worked. We had every reason to believe it would, because of the science behind it. Liquid-filled records was a little bit of a crapshoot as well: the liquid-filled record seemed like it would work, but to what extent would it be sealed or not leaking we didn’t know, and we kind of found out. Evaporation became an issue too, the water would just dry up from the coloured liquid inside. Another one was the playable etching on Sixteen Saltines. There was a different process to do with doing etching that your grooves could go through, that you could cut into. This was an idea that was cooked up by George Ingram, our mastering engineer, a vinyl cutter, and when he sits there and explains it to you, you’re like, “well no one’s done it before but it makes sense, it seems like it should work, let’s give it a try”. And so it did, it worked and the crowds rejoiced. WHF: We’ve seen a bit of the kit you have there on Third Man videos - do you have a main reference kit or are different bits brought in and out? BB: We’ve got a Pro-Ject and an old 16-inch radio transcription turntable in our main lounge, and that’s mainly for kind of ambience music. When we have live shows we’ll play stuff there, kind of party music. I try not to get too bogged down in the audiophile rabbit hole when listening to test pressings, because I want a turntable that’s kind of in the middle. I don’t want the absolute worst turntable and I don’t want the absolute best, I want something that a lot of people are going to have something better, a lot of people are going to have something worse. Middle ground is the best place to be. At the moment I like just a very standard Audio Technica AT-LP120; I like that it’s modelled on a [Technics SL-] 1200. I broke a Pro-Ject one day and just sent someone down to the local record shop and said, “Just buy me this, it’s two or three hundred bucks”. But I like the pitch control. Just the other day we had a test pressing come in and I was like, “This sounds off, this doesn’t sound right”. And I was able to change the setting and write to our cutting engineer, who wasn’t our usual cutting engineer, and say, “Hey this is pitched down 10%, I need to pitch it up 10% to get it to how the songs are meant to sound”. They went back and were like, “Oh there was a problem with digital file sample rates, we messed up on our end, we can fix it”. So it has worked in that regard, but also I like that this Audio Technica has a reverse button, so basically vinyl rewind. So when listening to a test pressing it’s really good, because if I hear an aberration, whether it’s a pop or a click or a tic, whatever, I can roll back much easier and find it versus stopping the table, spinning backwards and trying to cue it back up. I can go backwards and forwards with the same button and try to flush it out – a lot of times going backwards and a forward over a noise eliminates it. So I don’t get too crazy deep into fancy, expensive stuff. I do it all through a Sansui integrated amplifier that Jack really likes and seems to serve the purpose in regards to just very basic bass and treble control. Really, really simple, I don’t monkey around too much with that to be perfectly honest. Left-right balance is also probably the most important thing in an amplifier, I would say: 99% of the time, if you have non-fill on your record, so if the record didn’t press long enough to fully embed itself into the ridges on the plates, non-fill is going to result in a noisiness almost exclusively in your right channel, based on science of how the raw vinyl spreads out into the grooves. So being able to able to switch your balance and say, “left channel sounds clear, right channel is noisy as hell, clearly this is non-fill”. It can be common in test pressings and ultimately doesn’t require a new test pressing, you just tell your plant engineers, “watch non-fill on this”. It’s actually more common in test pressings than actual production copies. So that’s what I’m mainly using for test pressings. I’ve got some Grado headphones that are good for getting more detail, but nothing fancy. WHF: Are you using similar kit at home? BB: Yeah, 1200 ‘til I die. I had one that survived a pretty gnarly house fire, the things are built like a f**king tank. I’ve got one of the new Shinola Audio Runwell turntables that I haven’t properly set up yet. That’s definitely more of a showcase or, as my wife would say, a display turntable, for if we listen to nice records at dinner time – that’s not necessarily for spinning 45s or trying to DJ late at night. WHF: We can imagine you’ve a pretty hefty record collection: any idea how many you own? BB: I think it’s probably about 50-to-150ish 7-in boxes, and probably about 50 filled with LPs, whatever those numbers would be. It’s a couple thousand, more 45s than LPs. I would say probably LPs in the low four figures and 45s in the mid-to-high four figures. WHF: How many new records do you buy? BB: Most of the new records I buy are of old recordings. But you often get sent a lot - when you run a record label you send folks your stuff, they send their stuff, so I get a lot of new stuff that way. You don’t really get old stuff that way. You don’t call up Berry Gordy and say, “hey, send me the first year of Motown singles”. It doesn’t really work that way. WHF: Are there any you particularly cherish? BB: I often go back to this 45 by a band called The Keggs, a Detroit-area garage band who recorded two songs, only pressed probably 100 copies of it, studio burned down in the 1967 riots. It’s just brilliant, out of tune, wild, unhinged... just very, very inspiring. Additionally, since I was 11 years old, Nirvana In Utero. I have multiple formats, multiple variations, coloured vinyl, cassette, CD, Japanese versions, 12in, singles - all that stuff. I really, really do love that record. And I’m always searching for the next undiscovered, obscure Detroit 45: self-released, unknown, whether it’s a rock band, rap recordings, techno, or funk, whatever. I love the idea of independent music, people working out of basements in Detroit, pressing a couple-hundred copies, throwing it against the wall and seeing if it sticks. That being my home where I was born and raised, and where my heart still is musically. I had two in the past week, just weird Detroit or Michigan records, completely undocumented. Maybe they’re rare, maybe they’re not – they’re certainly obscure, I’d never seen them before. Once eBay launched their app, just every spare moment I’m trying think of weird terms I can search and see if maybe there’s something that hasn’t turned up before, constantly looking for that stuff.